The Reviewer ranked it 5 stars. I could only recommend one device for streaming video today, it would be the new Roku Streaming Stick. At $50 it’s one of the least expensive home video devices you can buy. It’s also one of the best. Roku is the king of streaming, with more worthwhile apps than anybody else. Its search runs circles around the competition, hitting most major services and presenting the results by price. And I like its interface better too, with its full customization giving the power to arrange the apps you want, where you want them. The old Roku Stick was my favorite device of its kind, mainly because it offered the cheapest way to get Roku’s service. I also loved the tiny design, allowing it to be tucked up behind a TV, out of sight, or even slipped into a pocket for easy portability. But I always found it too slow to respond, especially with complex apps. The new version — available for sale as of April 20 — is much faster, just as speedy in everyday use as the Roku 2 and Roku 3 boxes, and feels as responsive as any modern streaming device. It lacks the headphone jack and voice search found on the Roku 3’s remote, but you can use both of those features via Roku’s app on your phone, and they work great. Is there any reason not to buy the Roku Stick? Maybe if you’re perfectly happy with your current streamer. Or you don’t mind paying extra for that fancy Roku 3 remote, or you want the 4K streaming available on the Roku 4. If you have a bunch of stuff on iTunes or want to play phone or tablet games on the big screen, get an Apple TV. If you really love using your phone instead of a dedicated remote, or want to put video from your computer on your TV, go with a Chromecast. There are a few other good reasons to buy something other than a Roku, but most are corner cases or involve streaming “files” on your home network. 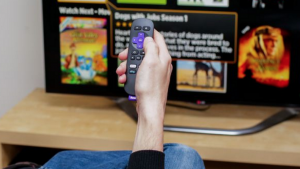 Streaming video is more popular than ever, and the new Roku Stick is simply the best device at the best price for pretty much all of your streaming needs.